Gamers rejoice, the inventor of The Peregrine, Brent Baier, has come from the future to bring you the latest in gaming tech. 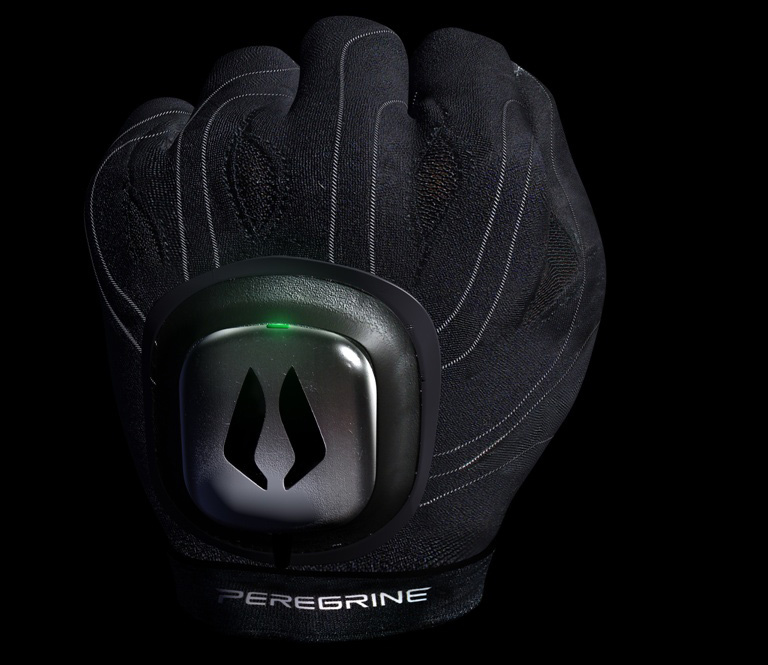 The Peregrine gaming glove is proof that the once thought Sci-Fi technology is coming closer and closer to reality. This device will immerse the gamer into a completely new gaming experience that has only before been imagined. The Peregrine is a comfortable flexible glove that uses innovative technology to completely replace the keyboard. The Peregrine will definitely prove useful in PC gaming. Some computer games demand rapid response to hit keys spread across the entire keyboard. This can interrupt your pace. Imagine ordering squads around in your favorite real-time strategy games with simple swift motions of your hand. That’s exactly what the Peregrine gaming glove accomplishes. While it may be a great idea for some games, I could only image the glove being awkward for other genres of games such as first-person shooters. Peregrine hopes to adapt to a variety of gaming styles and possibly offering multiple products to appeal to different types of gamers. 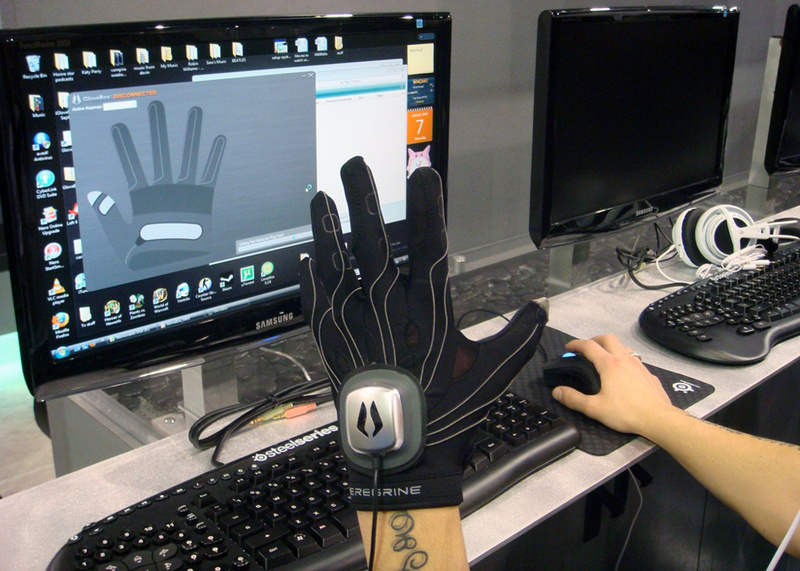 The gloves sports sensors on a metallic strip on your palm, the thumb, and across your fingers. These sensors respond to contact made with your fingers, palm, and thumb with ease. Each touch will trigger a specific command. You can use preset mappings or customize up to 30 commands of your own. Although this can sound intimidating and a bit complicated at first, I assure you that it was actually quite a smooth process after testing it myself. There’s even a quick calibration upon start-up to help familiarize you with the functionality to avoid a frustrating start. Visually, the glove alone looks pretty damn cool and will make you question where science fiction ends and reality begins. However, the product uses a standard USB port to connect to your computer. The USB cable attaches onto a magnetic break-away pod on the back of the glove rather than connecting directly to the glove. This prevents accidental damage to your computer hardware with sudden movements. After a quick one-time install of the software and walking through the calibration, the key stores any customs sets you create for the glove. Your glove’s custom settings will be with you where ever you go, irrespective of which computer you use. The Peregrine, besides being a bit genre-restricting, is an extremely innovative device that will surely change the execution of competitive gaming. The technology makes room for plenty of future products that will likely adapt even better for new games. The Peregrine glove will render both the keyboard and mouse, let alone controllers, entirely useless. Although a bit on the expensive side, the gaming glove will enhance a gamer’s experience and change the way we play games. Stay tuned, for our upcoming review of the product as well. How many people are going to come out with the same idea? motion and then send it down the cable creates latency.